Oh, dear, another month has passed. Another few sketches were done. 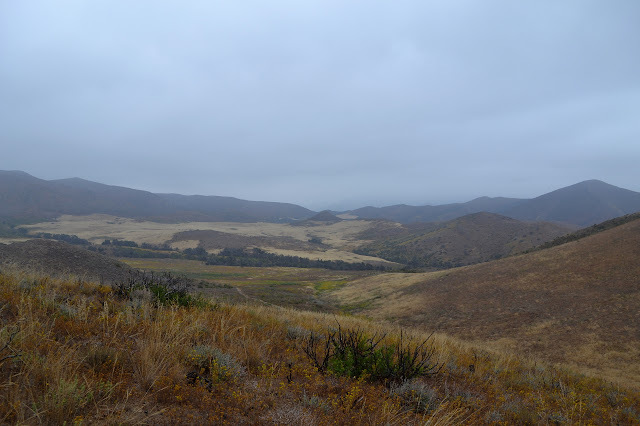 While on Noon Peak, I pondered the line of the range and of the OHV route. 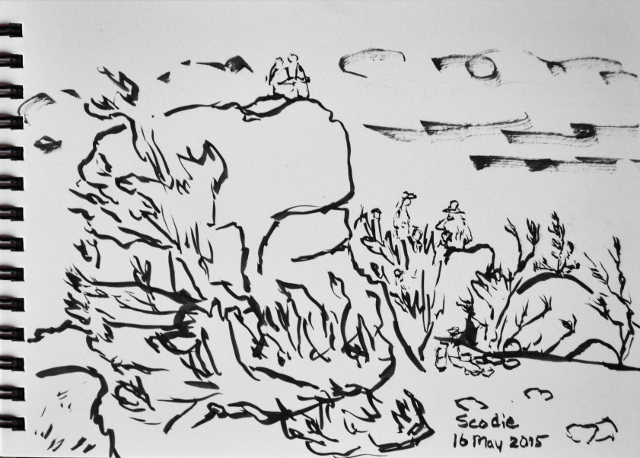 As the HPS and DPS group quietly celebrated being at the Scodie high point, each their own way. 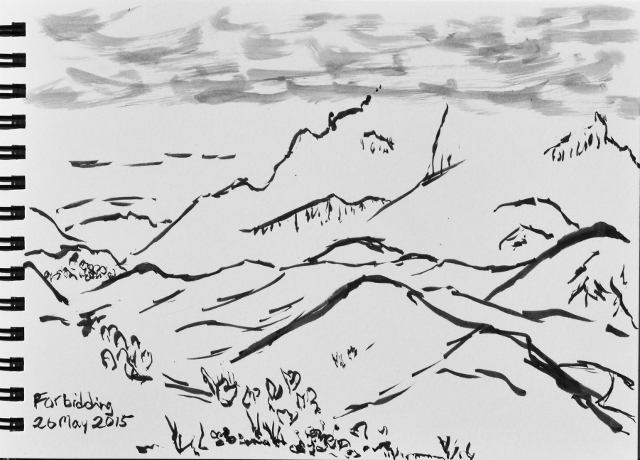 While coming down Mugu Peak, I found a good angle on Boney and Tripeaks, lost in the clouds. 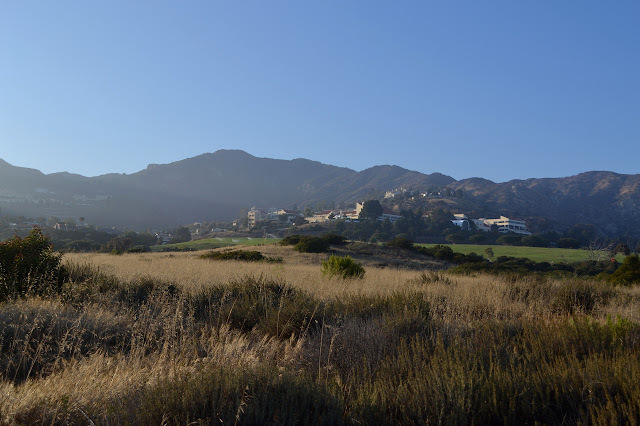 Stopping by Malibu Bluffs on the way home from Los Angeles almost proves difficult as one of the baseball fields has a ball game going on. One spot in across from an immaculate Bentley remains. Well it is Malibu. Most the rest of the cars actually fit better with my own cheap vehicle decorated by birds. The sign promises bluffs, but all we see are ball fields. We make our way past play equipment, pausing at a zip line like thing until noticing it is for "children 12 and under only". At the end of the path, there are some picnic tables and past the last one, a path into the shrub. It drops downward to a plateau below and mom is unhappy with some of the steeper spots, especially since the local bluffs have taught her to expect rather flat areas. After a silly bridge, we are at the edge of another downhill that drops down the the level of a row of houses by the sea. We can hear the waves breaking. 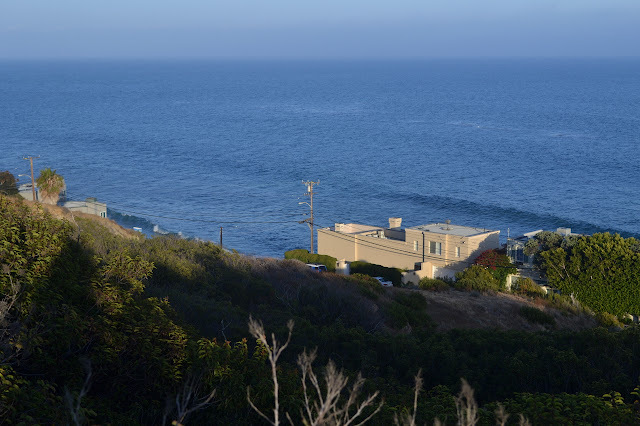 A single row of houses lines the edge of the coast with the waves crashing under their stilts. The path splits. The left side drops down again to the houses below, but we choose the right and follow the edge of the bluff to the west. The way is now quite flat. 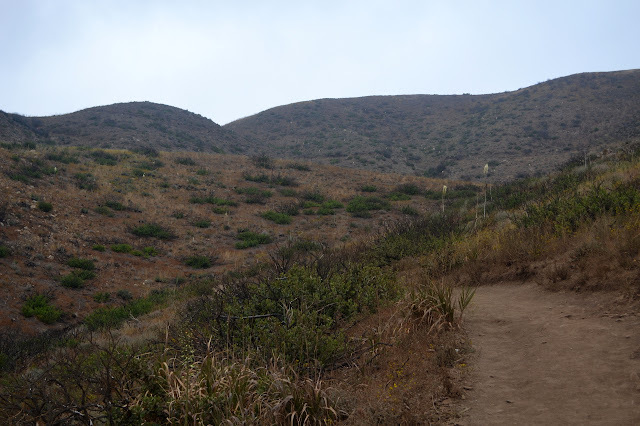 The trail has to curve away to the north and back down to keep flat and by the edge. Up the hill is Pepperdine University. 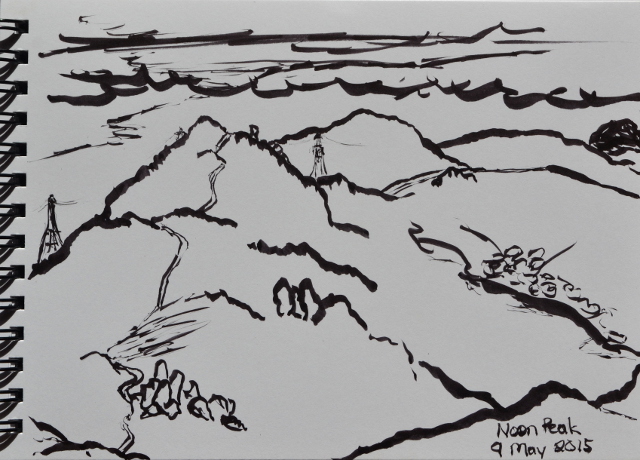 I thought it might be time to wander down highway 1 a little again, and settled on a very little bit indeed in going for Mugu Peak. 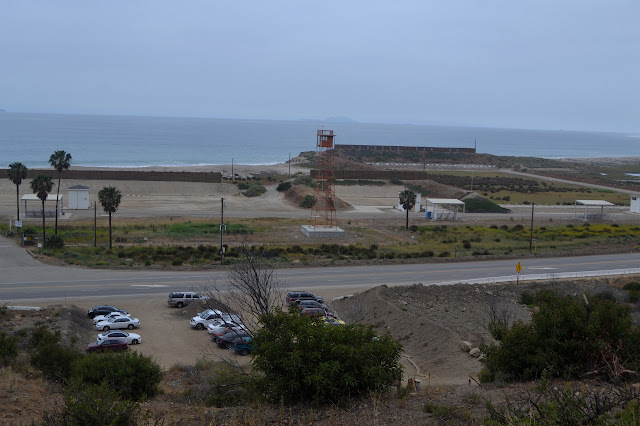 A postage stamp of dirt across from a guard tower on the naval base is the parking lot for the Chumash Trail and my starting point. It is nearly full of cars and people are moving in groups, often 4 or 5 strong, up and down the steep trail. The two year old burn on the hillsides still looks fresh in some places. A sign at the bottom warns me that a trail I want to take is closed below where I will hike it. This parking lot seems to be constantly almost full. Past the naval base guard tower, there is the shadowy Anacapa Island. The climb is quite steep, but the footing is usually pretty good. Tiny wiggles try to make the climb a little less steep. It almost works. The trail finds a little valley of sorts and a little more room to climb as it works toward the saddle above. It is not so steep until one last surge toward the top. Climbing to the saddle gives a first look into La Jolla Valley on the other side. After heading up Scodie Mountain on an official Sierra Club Hundred Peaks Section trip, we join our leader, her carpool companion, and one of the Bills to climb Five Fingers unofficially. A dirt road off to the left just north of the brewery at Indian Wells is our starting point. We park at a thing marked "powers well" on the map and whatever it is, the ruins remain. 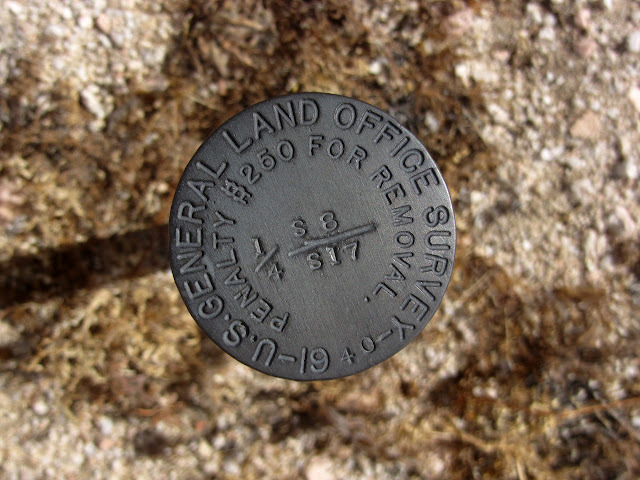 The Bureau of Land Management has an information sign and a lot of fences as we are on a 4x4 road surrounded by the Owens Peak Wilderness. There are fewer fences to the north where we are headed as the rugged land is expected to protect itself. The HPS groups usually start off a little further up the road, but it is a short and wide open, if steep, expanse we are about to go up and it can hardly matter where we park. Climbing the scree slope on the south side of Five Fingers, looking up the road along Indian Wells Canyon. We start up the hill where a small path winds briefly along it and vanishes. The slope is hard and we often sink into the scree. Rock outcroppings look attractive at first, but they just have their own pitfalls. Rocks that look like the tops of boulders turn out to be just so much more scree, just in large pieces ready to slide over the smaller ones. I am briefly distracted by a metal post sticking out of the hillside apparently at random and it takes a moment to process what I am looking at. Kristen's (our leader) piece of map showed two corners in the area, none of them up on this hillside, but it is a quarter section corner. I feel like I have won a little prize I did not even work at getting when I stumble over one of these. I think it looks like there is a line just under the face of the fingers above us and climb to cross near it. Bill seems to be thinking the same. Once we get there, the land just seems to laugh at us. We are wrong about the line. We work our way across anyway, sinking into the soft areas, sliding along the hard areas, and dealing with the boulders as we go. 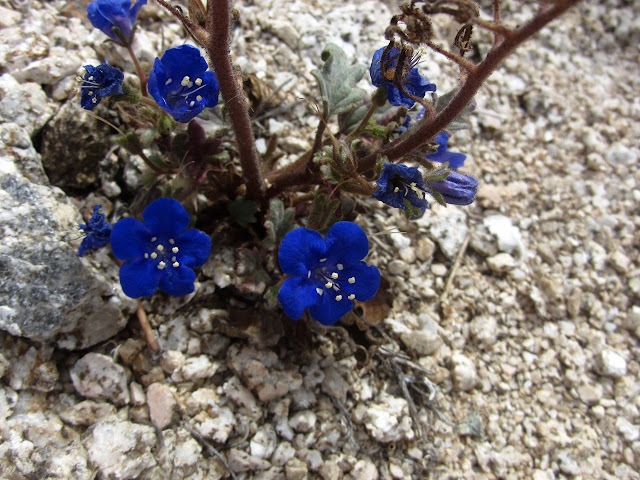 Nature provides some little things to notice on this hillside as well. Another weekend means there are more Hundred Peaks Section outings one might decide to join if one is so inclined. 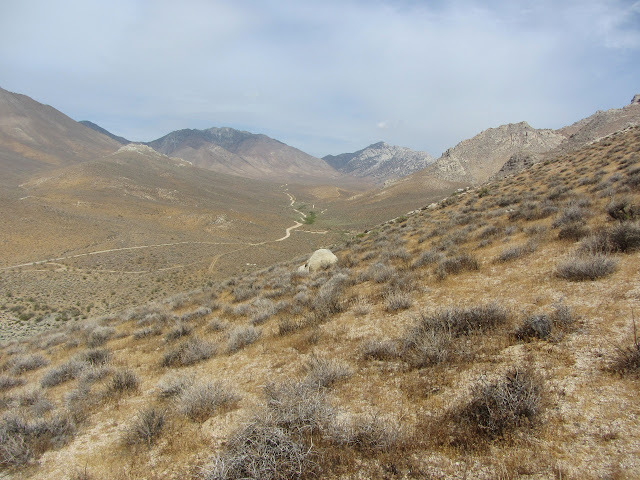 I noticed one coming up was for the very southern section of the Sierras, so southern most people do not even think of it as part of the Sierra Nevada Range, and was interested in checking out the area. I told Bernard and he was extremely interested and even tried to collect a whole crew to come out. In the end, only the two of us headed up to Walker Pass Campground for the guided tour up the mountain. Looking down the wash toward Walker Pass Campground. The overall group is quite large with fifteen hikers. 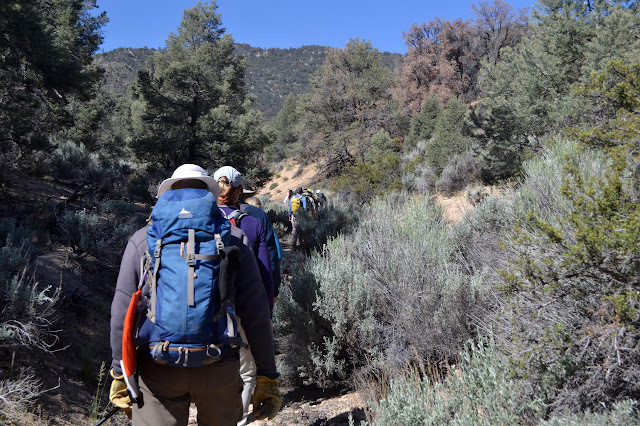 We climb the hill out of the campground to the Pacific Crest Trail and turn for Mexico. After a half mile on trail, we leave it for a shallow drainage. Most of the hike would be off trail according to the description. At first, it is quite easy going although still a little slower for being off trail. 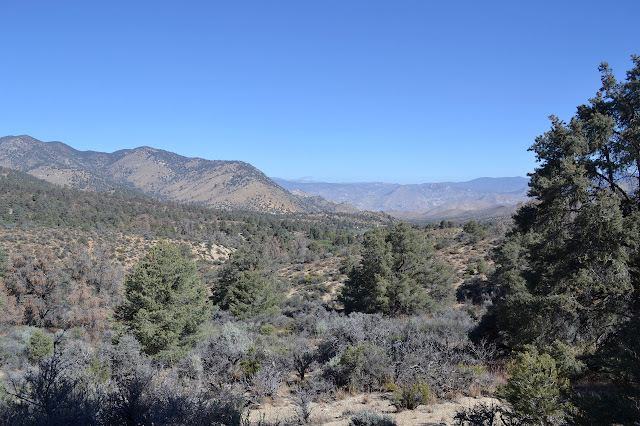 We pass mostly brush sage and pinyon pines with a few grey pines or something with similar hooked cones and a clump of willows. It is very easy vegetation to push through. Finding a way off trail in the bottom of a shallow drainage. People have been singing the praise for the rerouted and reopened Franklin Trail since the first phase of it, about 2.2 miles carving between numerous pieces of private land, opened in mid 2013. I heard about all the fencing that had to go up at the edges to open it and was very reluctant to try it. Opening the second phase, another 3 miles or so along utility roads, seems to have been delayed by something but has now opened. Meanwhile, the third stage, the old trail through Forest Service land, has had the initial cut to the top. Maybe it is time to try it. A group of geocachers, most of whom I do not know except as a signature, were heading up to see how far they might get and I thought I might join. They even made an event out of it, so a few extras showed up at the Carpinteria High School parking lot. (This parking is for weekends and holidays only.) With doughnuts. 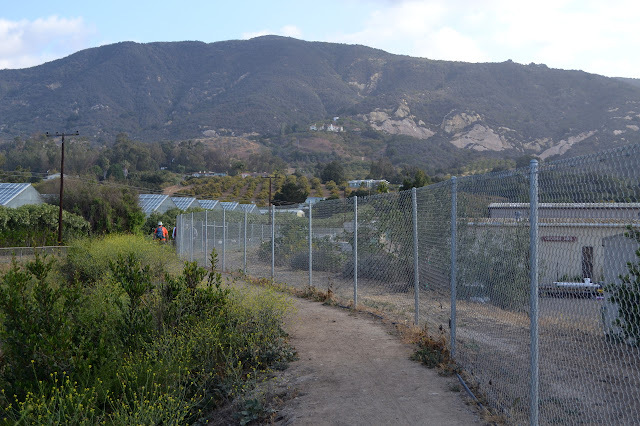 Eight started up the trail at the southwest corner of the high school, surrounded by fencing. Starting up the fenced in trail. Geocachers look just like regular hikers except they stop randomly almost every 0.1 mile and glance a bit too often at their electronic devices. Two of the group are lost quickly to the trail because they have no interest in the earlier geocaches, having already found those. One is lost to a prior time constraint. The fencing carves around the side of the school, then past industry and farms. Long trenches are dug in the dirt to try to keep the erosion down as the trail climbs directly up the hill. Suddenly, the fences stop. Chaparral spreads out above us and greenhouses below. Freedom! 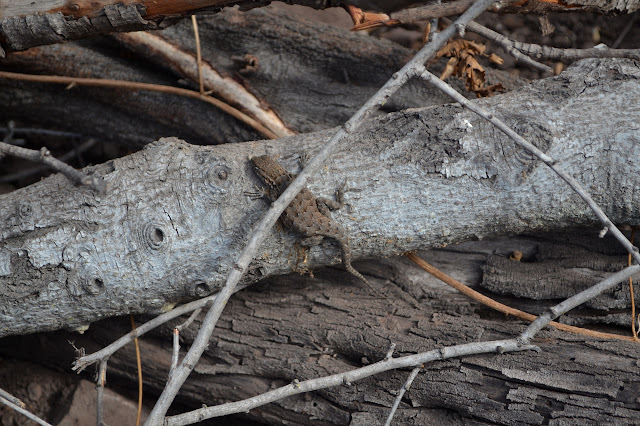 Lizard imitating the trail route below. Perhaps it thinks it looks less like a lizard with angles. 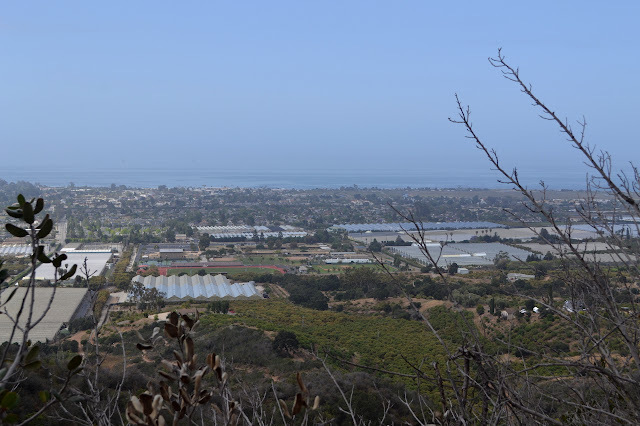 Greenhouses and avocado orchards sprawl below in Carpinteria.